"Why I'm Excited about GPS for Bird Hunters" -- Steve. "Keeping up with a big running bird dog is almost impossible without something to give you an idea of where your bird dog is and what he is doing. One of the major problems with hunting behind dogs is keeping up with their location. Even close-working dogs can get lost in heavy cover and tall grass. 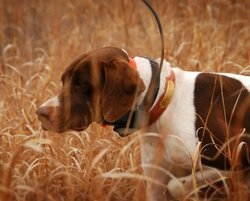 Keeping up with a big running pointer or setter is almost impossible without something to give you an idea of where your bird dog is and what he is doing. Folks have used dog bells, beeper collars and tracking collars over the years but none of these devices are perfect for the average hunter. BELLS -- I grew up using bells and they work fine for a really close working dog but they give limited information and they don't tell you when your dog is on point. TRACKING COLLARS -- Sometime around 1998 we started using tracking collars. Tracking collars are great because they let you know if your dog is moving or on point and they give you the direction where your dog is when you are trying to locate them. The downside of a tracking collar is that the information that you get is very limited. You never know the exact distance, you really only know the direction. FEW ALTERNATIVES -- We have been looking for an easy to use system that gives an exact location of the dog while making no sound while doing it. I have looked at every attempt by multiple companies to come up with a solution using GPS to keep track of a bird dog. While a few have been offered, they missed necessary features that would fill the needs of the bird dog and outdoor market. Either they required a computer to track the dog (WI-FI service on my hunting lease isn't really that good) or they were not waterproof or they used cell phone technology to communicate with the dog (same issue here - I can't trust that I will have good cell phone coverage where I hunt). The other major concern was that you had dog companies trying to make a product using GPS technology. It's a little more complicated than your average e-collar or tracking system. In 2007, Garmin introduced the original Garmin Astro and it changed the way we hunt. Now Garmin offers the latest generation of their GPS dog tracking collar -- the Garmin Astro 430 with T5 collar. In addition, Garmin combined their GPS Tracking Collar with a full featured Remote Trainer to create the Garmin Alpha 100 with TT 10 collar.